COUNTRY LOG CABIN: MODA BLOCK, ETC. I have been very slack when it comes to blogging lately. But I wanted to let you know that I've been doing a lot of sewing. 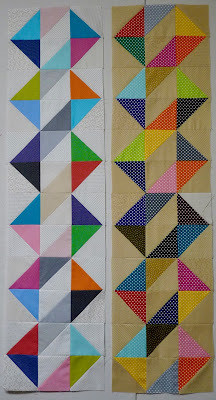 This is Block #5 of the Moda Block Heads block of the week. It looks large in the photo, but is only 6 1/2" square. I'm out of the background fabric now, but my LQS is supposed to get it in this week. That's why I don't have Block #6 finished yet. I need the light colored background fabric as shown in each corner block and the middle. There are 58 pieces in this block!!! These are 2 table runners I'm making out of a couple charm packs and they are ready to baste. Each HST block measures 4 1/2", so it will only be 12" wide and 48" long. 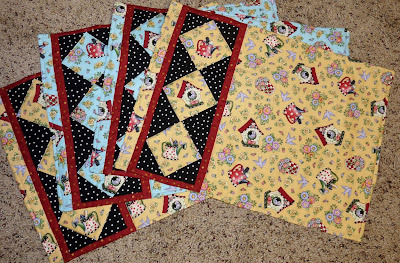 I "had" to make some placemats with Joanne Kerton's free placemat pattern found here. I found this Mary Engelbreit fabric in my stash and thought they would be cute. I love how they turned out! They still need more quilting on them, but I haven't decided yet how I will do it. Thanks, Joanne! If you want to get the pattern, click on the link and then scroll down to where it says a "few free patterns" and click on that, then scroll down again until you see this placemat pattern. Very happy tablerunners--and the placemats are cute in ME fabrics. Joanne writes her patterns well. Block 5 was a doozy, wasn't it?!! Yours turned out really pretty; love your fabrics. It's amazing what all can be done with simply half-squares in a variety of arrangments. I love the way you got the light center in the table runner on the left. Your placemats will make a very pretty table setting. All of Joanne's patterns are special. Glad you've been sewing; unfortunately, I haven't! Maybe soon. (I keep saying that, don't I?) ---"Love"
Sewing should always win over blogging! Well,we do like to eventually see what you've made, so please don't let your blog go completely dormant! If that block is 6 1/2", those are pretty tiny triangles! Your block looks great though. I hope the background fabric arrives as promised so you don't get behind on the blocks and have to do some catching up sewing. I love the placemats in the Mary Engelbreit fabric! I'm now all energized to go dig in my stash for a fun novelty fabric for a new set of placemats. I love that table runner! So simple but such an effective design. what super cute ME placemats. I have a little of her fabric in my stash. The runners are great - very modern! That's a lot of pieces in a 6" block, your block is great! I still haven't started on mine. The table runners are so colorful and happy looking. I love the placemats. Joanne has some great patterns! I am drawn to your star block in the blues. Good choice of color and fabrics. 58 pieces?! Yikes! That's a lot for a six and a half inch block. Very impressive. I like your table runners - I've seen that pattern on Pinterest and it's quite striking. 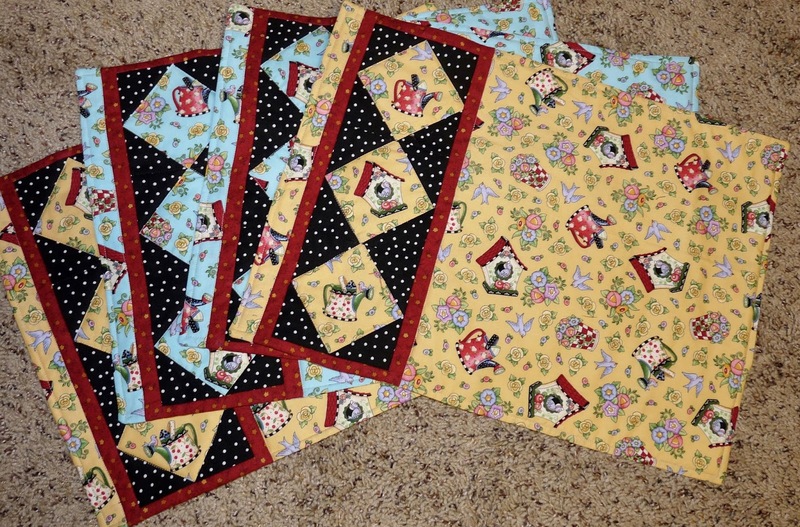 Your placemats, using Joanne's free pattern, are terrific - great fabric. Beautiful projects Ruth, that blue block is beautiful. 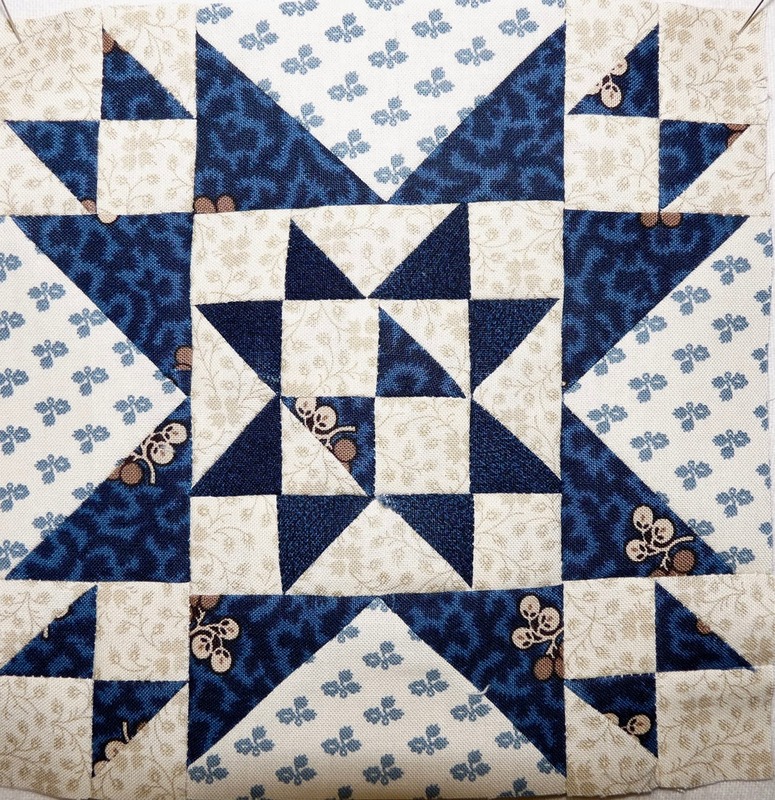 I've been quilting more than 20 years, sewing most of my life. I've been married 56 years, have 3 married sons, 3 wonderful DILs and 5 grandchildren. I am now retired from the U. S. Court! DH and I enjoy camping in our 5th wheel. 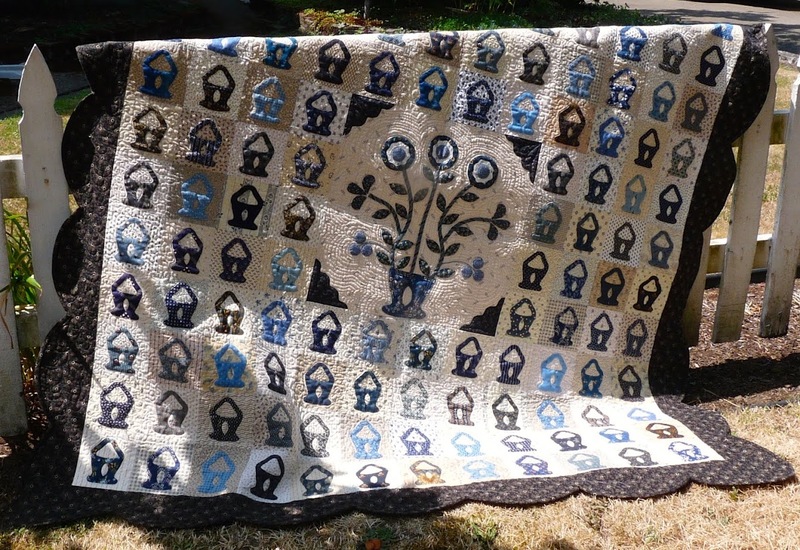 I have enough ideas to keep me busy for many years of quilting! 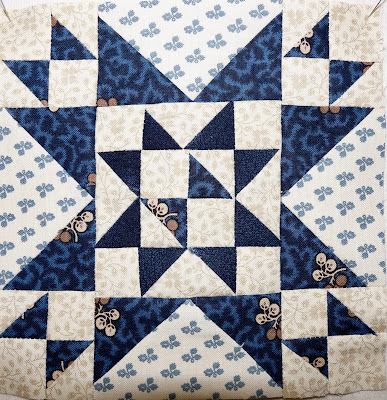 DOLL QUILT RECEIVED AND IMPORTANT NOTICE! Country Log Cabin. Watermark theme. Powered by Blogger.